Disney seems to be behind schedule with its MyMagic+ project to personalize its theme parks with RFID bracelets, the Orlando Sentinel reports. The company had indicated that the bands would be “largely” introduced by the end of September, but they are currently only rolled out to Walt Disney World Hotel guests. Because Disney didn’t really commit to a time frame — and because launches get pushed back all the time — the report isn’t that damning. The Sentinel quotes an analyst saying that the project has likely exceeded $1 billion in costs, and reports Disney resorts head Tom Staggs as saying he’s happy with the progress. Staggs spoke about the project at length as part of its debut in May at our D11 conference. The brightly colored bands link with online profiles for each visiting family member, and can be scanned at park kiosks to access advance ride bookings, receive customer service, and pay for all the stuff your kids want to buy. 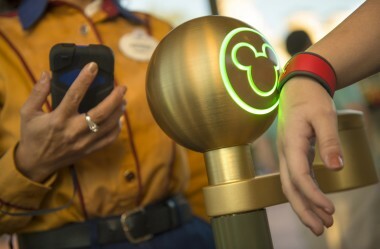 While wearing her MagicBand, your daughter who loves Disney princesses might be approached by her favorite of the park’s life-size characters and be greeted by name, Skaggs said. So, basically, it’s another creepy/cool personalization experience from today’s technology, with a sprinkle of Disney magic.